The Pyle PDIC speaker system delivers stereo sound to any room in your home or office without cluttering floor space. 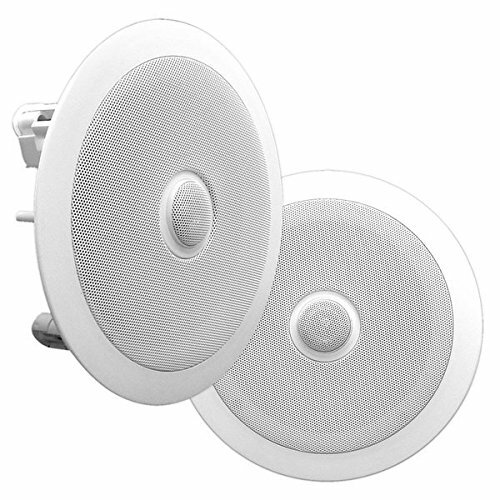 This pair of 6.5'' speakers can be used for in-wall and in-ceiling applications as they mount flush for a clean look. Perfect for custom installations, the PDIC series speakers feature titanium dome tweeters, impressive power handling capability, high-temperature voice coils and high-efficiency response rates – all to produce more full and rich sound. Convenient speaker terminals allow for quick and hassle-free speaker wire connection. System includes cut-out template for easy installation. Achieve wide-ranged sound performance and add audio to any room with the PDIC Speaker Systems. Sold as pair.